Food blogs are a wildly popular phenomenon these days. You can easily create and promote a food blog to show off your food styling and food photography. Right now, a great deal of interest is in food, recipe, and food photography blogs, and many loyal and dedicated followers, well, follow these types of blogs. Many chefs, home cooks, TV and magazine personalities, restaurant owners, and even folks who just appreciate foods have their own food blogs. You can also find blogs created by food photographers, food stylists, and food aficionados. Some bloggers even focus solely on one particular type of food — yes, marzipan food blogs are out there! Although you can find a lot of really interesting food-related blogs on the Internet, it’s a great big world, and there’s always room for more deliciousness. So here are two main things about blogs: First, you have to get the word out about your blog; second, you have to understand the time involved in the basic upkeep of the blog. If you’re going to have a successful blog, you need to commit to updating the blog nearly every single day. When it comes down to it, your followers are looking to you for a continuous stream of information and imagery about their favorite subject — food! Blogger and WordPress are the two main sites for blogs these days. Both of these blog tools are handy, really easy-to-use solutions that can help you create your perfect blog. Another bonus to using one of these blog sites is that the Flickr photo-sharing site connects nicely with both of them. If you’re posting your food images to Flickr, you can easily post those Flickr images to your blog. When posting to a recipe blog, photographing the preparation and cooking process — not only the finished product — is a really cool idea. These types of food-in-the-making images can make for some really interesting photos. 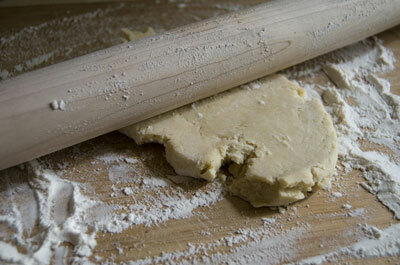 For example, when documenting a luscious pie recipe on a blog, you could initially show the process of rolling out the dough, as you can see in the following figure, and then folding the dough, as shown in the second figure. 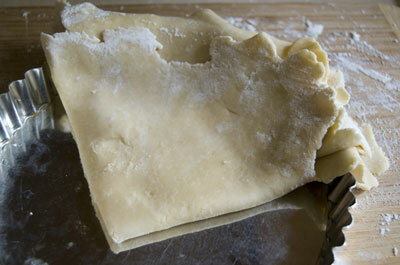 Folding the dough into quarters. When shooting the food preparation process, embrace the pots and pans! As you can see in the next figure, photographing foods, using well-worn pots and pans, baking sheets, and colanders can provide a nice down-to-earth look in a photograph. 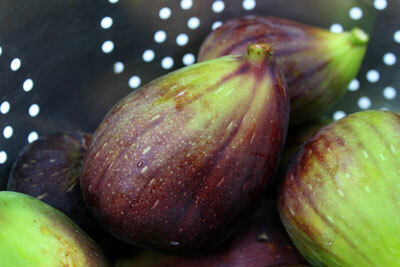 Placing these figs in a metal colander gives this image a down-to-earth, practical look.